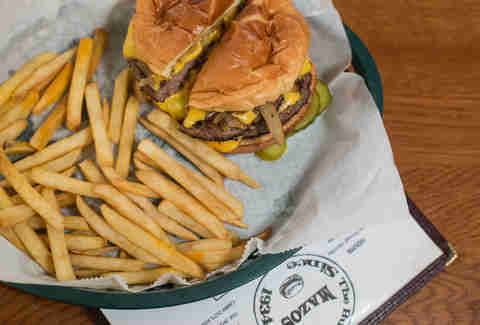 No matter what type of burger you prefer -- crispy, smashed patties or juicy, half-pound monsters -- you'll find a burger you love in Milwaukee. 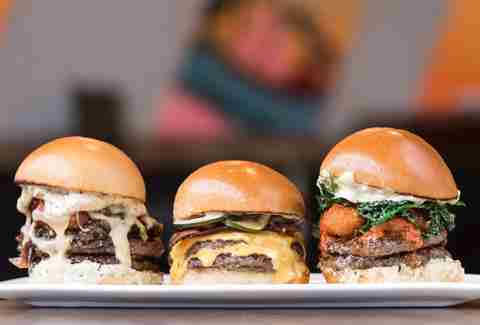 From diners to steakhouses, most restaurants in this city serve up solidly good burgers, so figuring out which one to try next can be a challenge... not to mention determining which among the city's many options are honestly epic. Fortunately, we're selfless enough to have gone and tasted all of Milwaukee's best burgers, just to bring you the best of the best (yeah, it was a huge sacrifice). This diner-style burger joint has been going strong since 1934, evidence that it does burgers right. 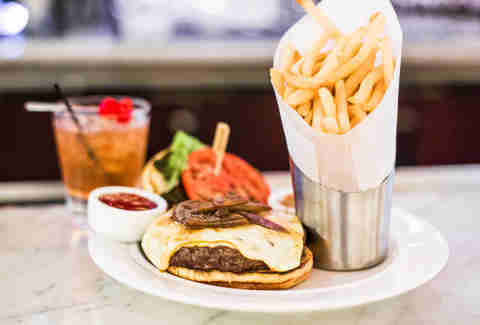 It grinds its own beef every single day, plus every burger comes with two sides; the correct choices being golden-brown American fries topped with a pat of butter and a cup of homemade soup. 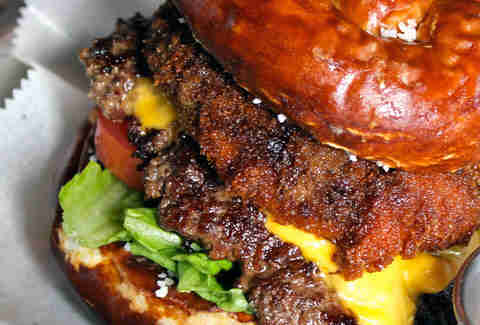 This is the matriarch of all burgers in MKE... so go for the classic cheeseburger. Big half-pound burgers get a deep crust on the griddle at this modern diner in 'Tosa. You can get it topped your way, but we suggest the Peppercorn Horsey burger, which comes topped with thick-cut bacon, cheddar jack cheese, and a mound of onion strings, plus creamy, spicy horseradish sauce. The sound of the bright, crispy crunch as you smash this burger down is immensely satisfying in a destructive kind of way. Plus a recent expansion and complete remodel of the space means that you and your four friends won't have to squish into a tiny booth anymore. Since opening, Merriment Social has mostly moved away from modern small plates and put its menu focus squarely on burgers and booze-filled shakes. Whereas there used to be one burger on the menu, it got so popular that there's an entire burger section now. We love them for that. The classic Merriment burger will always be king, with two thin patties, American cheese, homemade pickles, bacon, and a mustardy sauce, but you also can't go wrong with the $5 weekly speciality burger, which is available only during happy hour on weekdays. Expect to see creations topped with carnitas and corn salsa, or raclette cheese in a waffle bun. 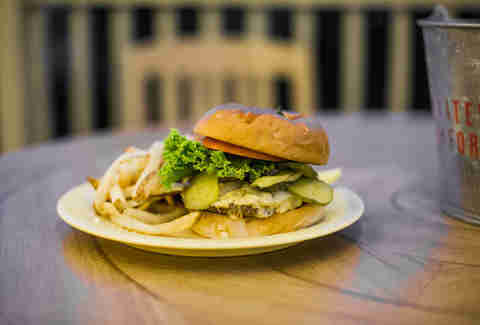 Kopp’s serves up the ultimate local fast food burger, butter included. 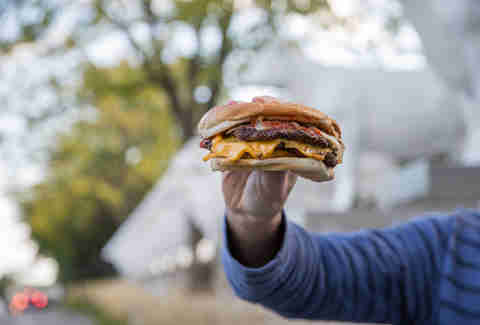 The patties are thin, but so is the bun, giving just the right meat-to-bun ratio. 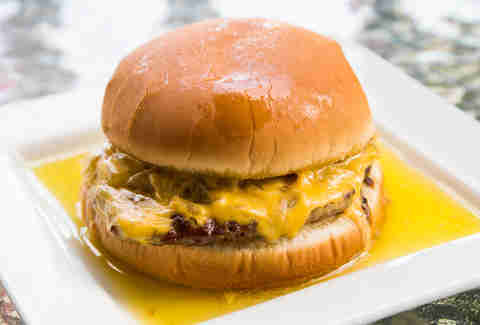 Add some thick slices of deli American cheese to hold everything together, and you have the double cheeseburger locals grew up on. Oh, and it’s the size of your face, so, you know, come hungry. Among Milwaukee's essential restaurants, Solly's is known for the thick smear of butter that pools on the plate, like a reflecting pool for your bold dietary choices. The Cheesehead burger is beyond belief, with two-thirds of a pound of beef, mushrooms, and stewed onions, all topped by a glorious crown of cheddar, Swiss, and American. You’ll need about five napkins for this one. 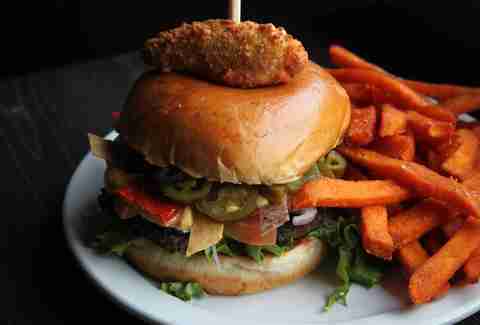 AJ Bombers mixes burgers with deep-fried foods because that's simply an excellent idea. In the case of the bomber burger, you can expect a breaded, whole portobello mushroom cap stuffed with cheese, cemented onto the burger... with more cheese, naturally. Just be careful of the hidden molten lava (aka cheese) when you bite into this one. 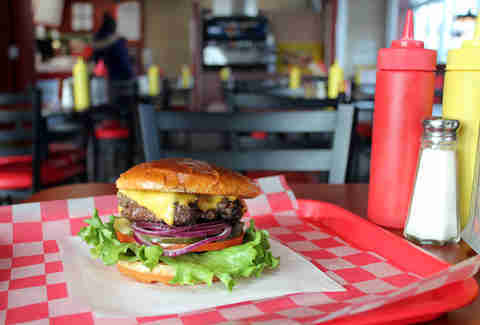 Nite Owl is only open spring through fall, and only sells burgers until it runs out each day, generally around 6:30pm. 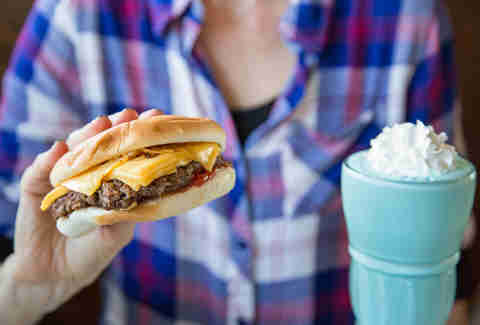 Make it a priority to get one, though, because these old-fashioned burgers are practically a religious experience. They’re hand-formed, so there are bits that fall apart and brown deeply on the griddle, and crevices that cheese can ooze into. If you want to really amp up the gluttony, pair this with a Superman shake. This upscale restaurant tops its amazing, eponymous burger with honey-glazed onions and tangy homemade relish, plus the most underrated burger cheese ever: Muenster. And since MSG’s specialty is steaks, you know they’ll cook your burger to the requested temperature perfectly. The Big O is named for the pub’s owner, Oscar, and not the euphoria you will experience taking your first bite of this juicy behemoth. Chorizo, bacon, onions, jalapeños, chipotle jack, smoked Gouda, and a side of chunky guacamole... all these toppings would make this bad boy impossible to eat, if it wasn't for the pillowy, locally made bun keeping everything in check. Sobelman’s is a Milwaukee institution, thanks in part to the Marquette students and alumni who fill both locations to capacity... and propel this joint's newest creations to viral status on Twitter. 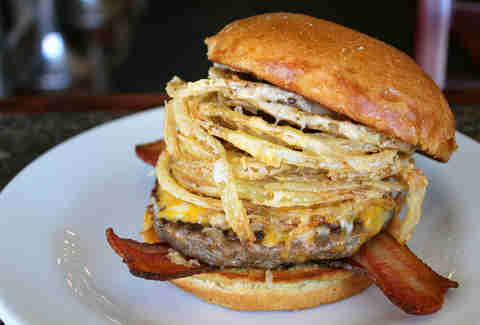 The namesake burger is a classic, topped with three cheeses, bacon, fried onions, and diced jalapeños. Add the spicy ketchup that's available on every table, and you'll be in pig (and beef) heaven. Even though this is a Chicago-style dog and Italian beef joint, you’d actually be remiss if you didn’t order the burger. It’s a fistful, cooked to whatever temperature you request, which is pretty uncommon for fast-food joints. Besides your standard rabbit-food toppings, try the Dawg Sauce, a creamy, buffalo-like concoction with a little bit of heat. Plus, this place offers free beer on Wednesdays. FREE BEER. Tuesdays at Goodkind are glorious, and for our favorite reason: it's burger night. 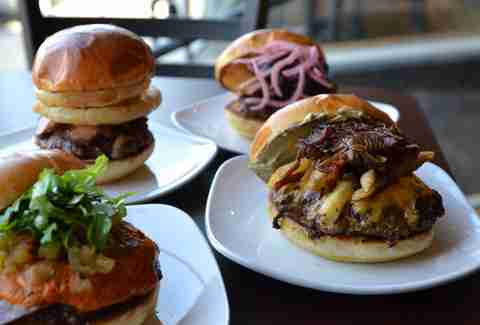 One burger is available each week, with beef sourced from local farms. Topping combinations range from unique -- like bacon and fava bean relish -- to classic-with-a-twist, like homemade cheese sauce and ramp mayonnaise. So as long as you're not devoted exclusively to ultra-classic burgers, the weekly variations will knock your socks clean off. If you've got an idea for some weird burger toppings, chances are Cudahy Burger Joint already has a burger like that, or at the very least you can build one of your own from the long list of toppers. A split-and-grilled andouille sausage? Get the Bayou. Hot giardiniera and beer-glazed onions? Grab a Fire Station. A double burger with pepper jack, onions, mushrooms, pulled pork, Sriracha mayo, and tater tots? That one's called I'm in Hell, and it's only available on weekends for breakfast and lunch, served with fries and a Red Bull. 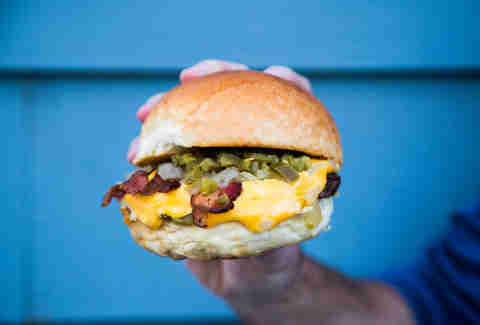 While Camino is known for its kimchi-filled grilled cheese (the Kimcheese), its burger should not be overlooked. 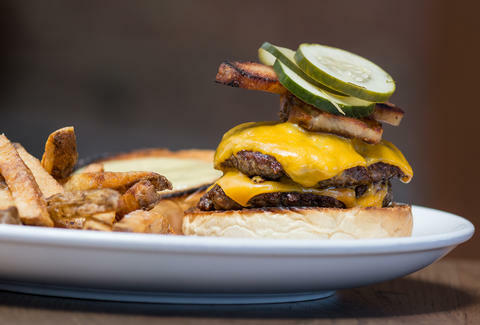 Since this is a pretty chill beer bar, the burger is cooked right behind the bar with a half-pound patty, gooey American cheese, and fried onions. Get them for just $5 on Mondays, or spice up your routine with speciality burgs on Wednesdays. And when you're finished, plug a few quarters in the Burger Time arcade game and pretend you're 12 again. Crafty Cow got its start as a popular spot in Oconomowoc and has since expanded to trendy Bay View. 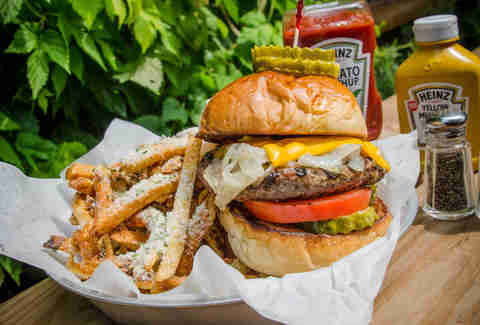 The specialty is a Juicy Lucy-style burger, with cheese and other goodies stuffed into the third-pound patties -- we're talking every kind of cheese you can imagine, from Gouda to goat cheese. Grab a specialty burger that's a collaboration between local food businesses, with some proceeds going to local charities: the Farley tops a burger with cheese spread, duck fat onions, fries, and an aioli made with Bittercube cocktail bitters. CRAVE Cafe is owned by the same guy as East Garden, a Chinese restaurant just across the street, so it makes sense that CRAVE's burgers are inspired by world cuisines, including Korean, Mexican, and Japanese. Opt for the Korean BBQ burger, which combines the standard third-pound patty with sweet Korean barbecue glaze, American cheese, spicy mayo, kimchi, and cabbage slaw in a glorious fusion mash-up. Fries on the side can be finished with ranch, cheddar, BBQ, or Cajun seasoning to shake things up even more. Lacey Muszynski is a Milwaukee native who spends a lot of time thinking about burgers. Follow her on Twitter @worthhersalt.